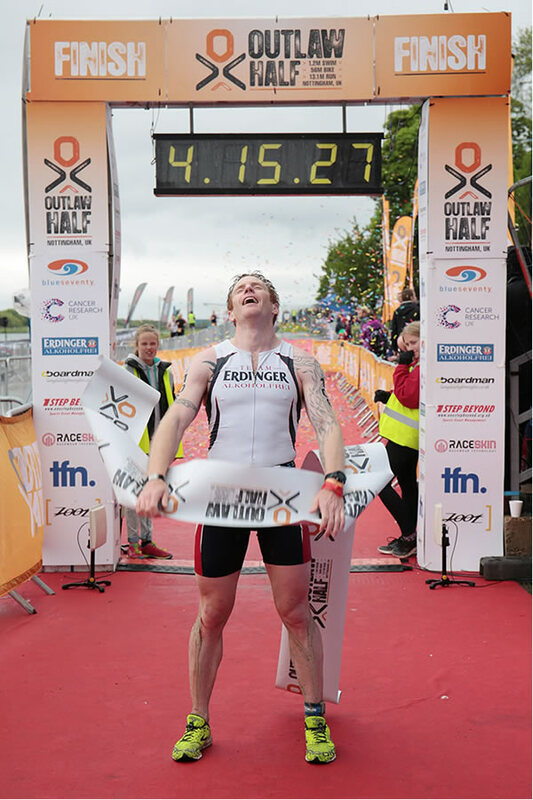 Sunday's third edition of the Outlaw Half Triathlon proved to be a good day for our regular columnist Karl Alexander. 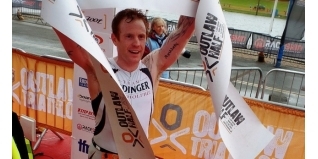 Third in the event last year, he "felt confident that I could move higher up the podium" this time around - and his belief was realised, as he was able to win the the event in challenging weather conditions. Here is how he did it. (We also have a separate report from the event HERE). 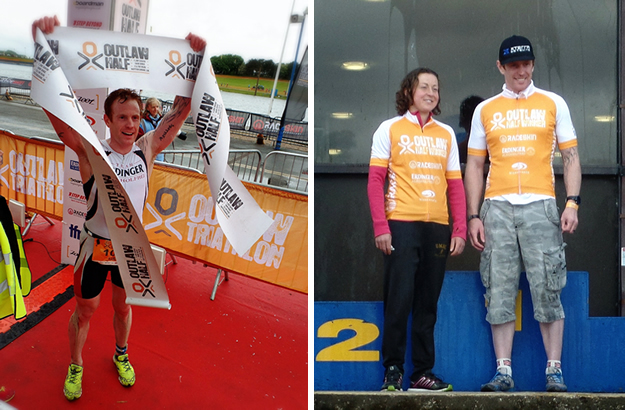 When I raced the Outlaw Half Triathlon last year I was happy with my third place result. This year however I felt confident that I could move higher up the podium. I knew it would be a difficult task as both the athletes that beat me last year were taking the start line, namely Paul Hawkins and Ian Turner. In addition there was other threats from the likes of fellow ERDINGER team mate Tom Vickery, VCUK's Alex Foster and the machine that is Hywel Davies (Planet X). Having been on a family holiday in Weymouth the week before, my build up had been quite relaxed and whilst I took my bike with me, I only managed a single ride, which had meant I was well recovered and very motivated. With the alarm set for 4:30am I got a good night's sleep and woke with the alarm to pouring rain and strong winds, a stark contrast to last years bright sunshine and high temperatures. Whilst this may deter some, my confidence grew as I go very well in these conditions and can tolerate the cold well. In a pre-race interview to the guys at Dreamtime TV, I made a statement about bike handling that would leave me eating my words and some tarmac later on in the race! The age groups are split into waves and this year I would be starting at 06:30 in the silver capped wave one in the 35-39 category; with us would be the 25-29's including Tom Vickery and the relay swimmers. At 6:30 the claxon sounded and we were off, the water temperature was a balmy 14 degrees and having positioned myself over to the left side of the 'fast' pen I got off to good start. About 300 meters into the swim I was being distanced by the lead group, but something seemed to click, I found myself swimming smoothly and within a few minutes was moving back up through the leading group where I stayed exiting the water in the top 10. Running into transition I started to take off my XTERRA Vortex Pro wetsuit and could see Tom Vickery ahead doing the same. This came as a shock as Tom is a stronger swimmer than me and usually goes out on to the bike with a few minutes lead. After a few seconds I was following him out on to the bike course. The first mile or so loops the lake and with a strong tailwind I was quickly up to over 30mph, but at the top of the lake it's a u-turn back down meaning that you were now into a block headwind. My Planet X Exocet 2 is ideal in these conditions and with every pedal revolution I was drawing closer and closer to Tom and within three miles I made the pass. Glancing back, Tom has upped his pace to stay with me and whilst he is a friend and a teammate I wasn't prepared to let him do that easily. Knowing that the short climb of Shelford Road wasn't far away I accelerated hard and over the top the gap had gone out and I was chasing the leaders. It wasn't until the climb of Oxton Bank that I caught sight of the next rider, Simon George of Lincoln Tri in his first middle distance event. On the climb I reeled him in and just over the top I made the pass. With the next section a long downhill I never made much of a gap, but on the undulating roads back into Lowdham and a head/cross wind, the gap began to open. It was here that I saw two more riders ahead plus the lead motorcycle and over the next few miles I slowly but surely rode across to them and as we started the southern loop I was ready to make the pass. With the road turning back into a headwind I upped the pace and passed Raphael Deinhart (Team High5) and Mark Redwood (TFN) in quick succession, noting they both had black backed numbers identifying them as relay riders. I was now leading the Outlaw Half. Over the next few miles I worked hard to distance the relay riders and after six miles or so I had succeeded - I would later learn that Mark suffered a puncture and rode the last five miles on a flat tubular tyre. Kudos!! 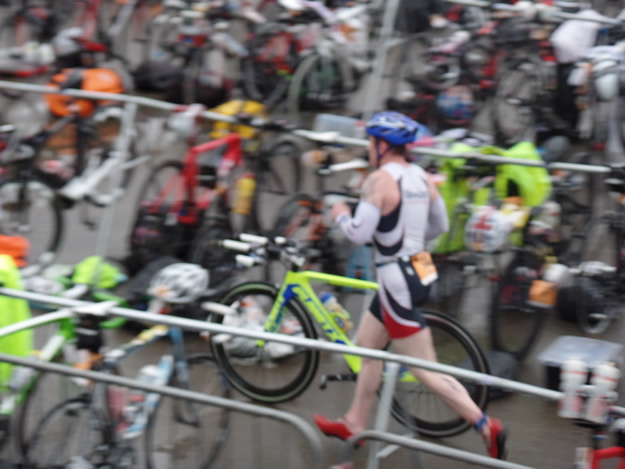 As I came into transition I had a comfortable lead and was feeling great. On the short downhill about 100 meters from the bike dismount I negotiated a small speed hump - and by negotiate I mean hit a greasy patch, lost my front wheel and unceremoniously smashed into the floor. The bike slid! I slid!I lost skin and my beautiful bike lost bar tape! Before I had come to a stop I was back on my feet and running to pick up my bike. A volunteer had kindly picked it up and thanking them I ran into T2 with the fastest bike split of the day. There was some confusion from the race commentator who announced over the annoy that the lead relay rider had come in, a few seconds later he corrected himself identifying me as a solo athlete. Pumping with adrenaline I headed out on to the run and with the first few miles along the banks of the River Trent including a u-turn, it gave me an opportunity to see what lead I did or didn't have. I made the turn and saw the lead relay runner and then second placed Ian Turner (Greenlight PT). I estimated I had about a two minute advantage. Either way, I was concerned and picked up my pace promising myself I would stay ahead of the relay runner until we got back to the lake. As Tom McGlashan (TFN) approached I upped my pace to stay with him and did so until the end of the lake. I had intended to sit in behind him on the return headwind section but without a swim and a bike in his legs to slow him down the pace was a little too hot for my tastes (and ability), and I had to ease up. It was on the return section that my body was sending ominous signals, I needed a 'comfort' stop. Looking across the lake at the feed station by the scoreboard I spotted what I was looking for and made that the focus. As I approached I asked the camera bike to let the lead cyclist know I was stopping and the duly did. It's quite unusual to leave a toilet and have a lead cyclist and a motorcycle camera crew waiting for you, but since they were still there that meant that Ian hadn't caught up yet. With renewed vigour and a spring in my step I set off. At the turn the gap was similar to that of the first lap and I was growing in confidence. I had four miles left to run and was still feeling strong. I gave it my all, and as I ran the final 500 meters I started feeling light headed but I knew the finish line was fast approaching. With my second surge of adrenaline I ran harder and faster, crossing the line in 4:15:19, a great time given the conditions and the second fastest time ever. After a nervous wait to see if anyone in the later waves had gone faster, I had it confirmed that I had won! It's an absolute honour to have won one of the most iconic events in the UK and this ranks as one of my best results so far. Massive thanks to my awesome sponsors ERDINGER Alkoholfrei, XTERRA Wetsuits, Planet X and Last Mile Supplements for their continuing support!